This is a terrible shame for London’s music-playing community. With Enterprise, the 12 Bar (and across the street the Alleycat) and the retailers, Denmark Street has been a real community, where musicians played, rehearsed, bought and maintained their gear, and hung out. That will end now. Nothing they could put in its place there will ever replace that. Nothing, that is, that the property developers behind all of this, the Consolidated Property Group, put there will ever replace it. If you’re having trouble imagining what that will be, take a walk through the alleyway next to St Giles in the Fields, past the Phoenix Garden, across Shaftesbury Avenue, down Mercer Street and into St Martin’s Lane. Continue until you see a Jamie’s Italian on your left hand side. That’s the western entry to St Martin’s Courtyard. Give it five years or so, and in all likelihood that’s what Denmark Street will look like: a privately owned piece of defensible space, monitored discreetly by private security, comprising a spa, some expensive (though not exclusive) retail and some upper-middle-price-range restaurants. Feel like we have enough of these places already and don’t need another? Me too. But this is a digression. As I said, nothing that Consolidated (what a hateful, foreboding name!) put there will be an adequate replacement for what the musician community of London is losing. That’s why we have to replace it ourselves. The glory of the 12 Bar Club was that it was one of the few really great central London venues, in a place that was a destination already. Denmark Street had been a musicians’ hub long before there was a 12 Bar Club; musical folk wanted to spend time there, and all of us living in this sprawling city were at an equal disadvantage getting there. It wasn’t in anyone’s neighbourhood, so it was in everyone’s neighbourhood. And it was readily accessible to those coming in from outside the city, too, who naturally enough gravitate to the West End. I live in Lewisham, south-east London, 10 miles from Holloway. If the 12 Bar had reopened in Brixton, it would be 9.5 miles away from a musician living in Leyton. That’s the scale that London is built on. 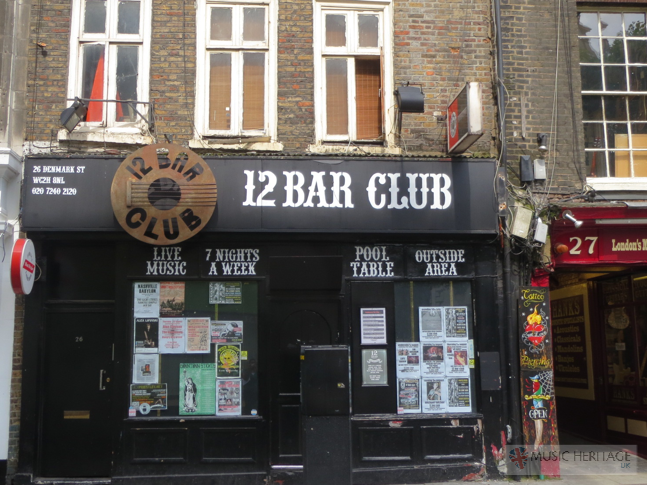 Those of us who live south of the river, or out in the west, must resist the temptation to start thinking of the 12 Bar as a “north London venue” and forget about playing there, hanging out there. If we do, it will likely fail. And we will all have lost something special. The continuance of a London music community is entirely dependent on the effort we put in to maintaining it. This entry was posted in Gear, General, Music and tagged 12 Bar Club, 12 Bar Club closing, 12 Bar Club Holloway Road, 12 Bar Club moving, Consolidated property development, defensible space, Denmark Street, Denmark Street redevelopment, Enterprise, Jamie's Italian, Little Differences, London, musicians' community, Phoenix Garden, property development, regeneration, St Giles in the Field, St Martin's Courtyard, The Alleycat on January 15, 2015 by rossjpalmer.